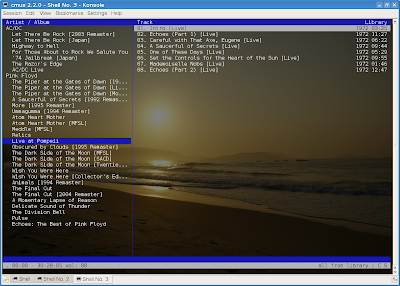 Also named C* music player, CMus is a powerful player featuring an ncurses interface, with support for audio formats like Ogg Vorbis, FLAC, WAV or MP3. It comes with 7 different view modes (the default one is called the library view mode and includes two panels, one as a file browser and the other one as a playlist), support for themes, configurable shorcuts, Vi-style commands. I found CMus to be extremely fast, highly configurable and flexible. 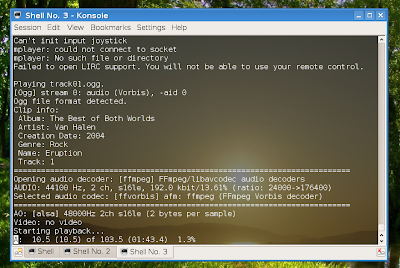 Definitely worth a try for those who are looking for a terminal-based audio player. 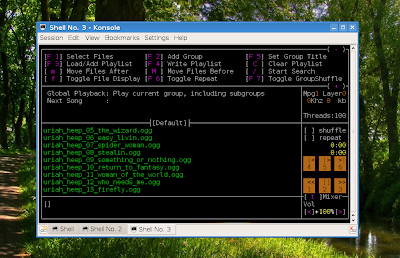 Yet another powerful and popular audio player for the terminal, MOC (music on console) has an ncurses interface, it supports various formats (the ffmpeg-moc plugin extends those to bassically everything ffmpeg supports), it is easy to use. It comes with a twin panel interface and allows themes too. MOC is very popular and provides a good alternative to players like CMus or mp3blaster. It's unlikely that any audiophile who prefers to play his music in console mode didn't hear about mp3blaster. Just as the name suggests, mp3blaster is a MP3, WAV and Ogg Vorbis player, with an ncurses interface. The last release is 3.2.5, and although it was rarely updated over the couple of years (except for minor changes), it's full-featured and a good alternative to the players mentioned above. Well-known for its video capabilities, mplayer can also play lots of audio formats in command-line mode. Some of the audio formats mplayer reads are Ogg Vorbis, MP3, WAV, AAC, FLAC or WMA. I can recommend mplayer for those who want to be able to play virtually any audio file out there, and not stay only with MP3 or Vorbis. Also, following a server-client model, there are two other powerful ways of playing music, mpd + ncmpc (music player daemon) and xmms2 + xmms2-client-cli. i've been using play from the SoX suite but only because it's all i know at the moment. i will explore these others. thanks for a good article. I'm not sure about the point here. I run Amarok for my .mp3 collection. Songbird is also available. 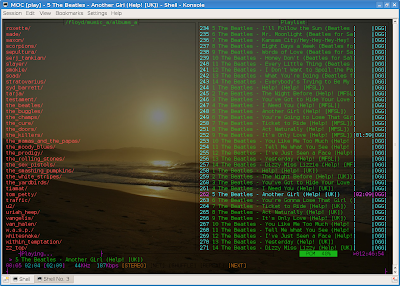 For streaming audio I run Streamtuner with XMMS. Right now I'm listening to my favorite audio stream - egoFM a German station. Now if you could help me tag my 60Gb music collection that would be great! Please note I've changed my Blog address to - http://jjmacey.net/blog/. VLC also has a rather nice ncurses mode. pytone is also missing from this list. Anonymous @ 3:21 Did you mean this one? Dag, the link doesn't work either.